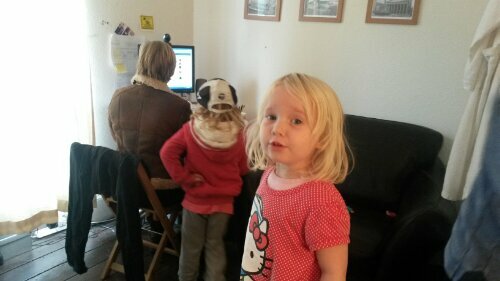 The children are visiting at the moment. Yesterday Molly and I had matching pigtails. We also went swimming. When we went in the small kiddies pool, Molly said, “Oo, it feels warm and hot and nice. Like chocolate mousse.” Which is fair enough, I guess. While everyone else was having fun and splashing about, I decided to go for a swim in the big pool. I didn’t have my goggles but I thought I’d just deal with it. It’s fine. No problem. Off I went, to the grown up pool and got in the lap lane and got my Olympic brain on and set off. It was a disaster, people! It was a disaster. I started with breast stroke. My face went under so I closed my eyes and breathed out and when I came up, I opened my eyes but there was still lots of water on my face which went in my eyes so that hurt. And confused me. So the next time I went under, I closed my eyes too late. Which confused me further so I forgot to breathe out properly. The next time I came up, my eyes were stinging and I had loads of water in my nose and mouth. I was a mess. I started to get all breathless cause I was breathing in and out all at the wrong time. My face was a mess cause my eyes were red and I was coughing and spluttering like an idiot. I was panting like an old person trying to climb stairs. It was just all wrong. All wrong. I’ll never get to the Brazil Olympics like this. I feel like I’ve really let myself down. 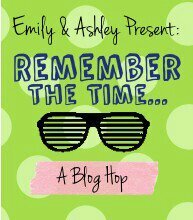 This morning, I am joining in with Emily and Kelly’s Remember The Time blog prompt. For some reason, the first thing that sprung to mind is the following story. It’s a bit feeble but I’m just going to run with it. When I was about ten years old, I had an operation on my hip and spent about six weeks with plaster down both of my legs. A lady used to bring me work from school so I didn’t fall behind. I think, actually, because I didn’t have anyone around me to distract me, I got quite far ahead with things. When I then went back to school, I was ahead of everyone else and bored so I got a bit restless and naughty. Because my operation meant I had to use crutches for a little while and had a huge healing scar, I couldn’t go swimming. I used to still go along to the swimming pool but would just sit on the side. This particular day, I had an idea that I wasn’t going with them, I’m not sure why. 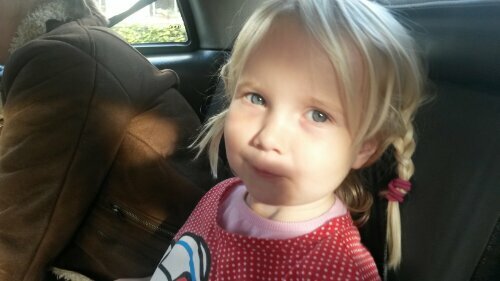 Then someone came and found me and said I was supposed to be on the bus. So off I toddled towards the school gates to the bus. My teacher, Miss Moore, saw me as I approached the bus and came over and really bollocked me. And this, my friends, is the moment at which I totally broke the rules. I broke the rules of the teacher-pupil relationship. I broke my own rules of good behaviour. I broke the rules of respecting authority. This was the first thing that sprung to mind when I saw that I had to write about breaking the rules. When my teacher shouted at me for being naughty, I said…..
Wowzers! What on earth was that about?! That is crazy talk. And even though I’m 28 years old and have done lots of other things in my life, had numerous jobs and lived in many different places, for some reason, this singular incident when I was 10 years old is my first thought when I am asked to write about breaking the rules. Making pizzas on Friday nights with one of our student’s mums. Stuffing our faces at the Nest Hotel because we were pretty poor and ate mostly rice at home. The time Fiona and I took a road trip round the whole country and had no radio so had to sing to each other all day. Our comedy dog, Diaz, barking at the kids at school or following us around or weeing on the floor. The time we were stranded in the desert with no water, no money or bank card, no ID, no suncream and no keys to get back into our car. The time Lucy and I were painting murals on the wall in the creche where we taught and the kids started singing Atomic Kitten to us. When I used to jump in the freezing cold swimming pool every morning at the guest house where I lived and worked in Namibia. The time we walked out to Diaz Point, which took hours and hours, and we had three apples between us. The time I lost control of the car and went on a little spin off the road with Fiona yelling “Steer into the spin!” and clinging onto the dashboard. Singing the Amarula song with the kitchen staff at Grootberg Lodge. One of my students, Zara, saying “Thank you for teaching us,” after a class. Bungee jumping, like a loony, over the Zambezi River during a stay in Livingston. Sleeping through the most important day in the Namibian calendar, their independence day, then making a story up for the newspaper afterwards (we ran the local town newspaper and we had to make up the main story of the whole year. Shoddy). Climbing into the big wardrobe in Lucy’s room with our friend, Andre, to look for Narnia. We were sober, by the way. Packing a tent, some sleeping bags, a loaf of bread, a jar of peanut butter and a knife and walking to the campsite just out of town, Shark Island, and camping for the weekend to get away from it all. Flinging ourselves in the pool to cool down after a hot sweaty bus journey back from Victoria Falls to Windhoek. Taking a load of disadvantaged kids away for an activity week in the desert and, among other things, teaching them how to swim. Drinking cups of rooibos tea and watching the sun set over the Atlantic ocean and the clouds and sky turning pink and purple and orange. Fiona and I going to the coolest bar in town, Rumours, and graffitiing our names behind the bar. Cutting my own hair because I had no money for hairdressers. Fiona chucking a glass of triple shot Jaegermeister and coke on a car. Going to badminton club on Tuesdays and being rubbish at it. At the start of September, I posted a bucket list so I thought it was time for a little check in, to let you know about my progress. 1. Join a book club. Ok, I still look hopefully at signs in Waterstones stores or online and intend to do it. To be honest, I forgot I’d kind of obliged myself to do it by writing it here so I forgot to make myself join one! I’ll do it, I promise. I don’t swim as regularly at the moment for a few reasons. The main one is that they close the outdoor pool from October til April and the indoor pool isn’t as fun. Also, I pulled a muscle in my leg a few months ago so took ages to get back into it. Perfecting breast stroke is my main focus when I do get to the pool. Fail no. 2. 3. Go back to Namibia (or at least make solid plans about it). Ok. This one is going well. A friend who I worked for as a travel consultant is over from Namibia at the end of this month. We are going for a drink to discuss a two week trip to Namibia next year. 4. Go on (or plan) an epic walking adventure. Ummm…. Does Richmond Park count? This one I did…. Kind of. I ran for the bus this evening, which I jumped on in haste then five minutes later realised was not on its way to my house. It was the wrong bus. I ran. I ran for a bus. And it wasn’t even the right bus. But I did run. This is a fact. 6. Go to Secret Cinema at least once. Ummm…. I went to the normal cinema last week… Does that count as being half way there? 7. Sign up for a college course (not sure what in, I just think would be fun. Maybe food). I’m thinking of doing a course in history or ancient civilisation or something. Another thing I forgot I’d told the world I’d do so forgot to sign myself up for something. 8. Go to that restaurant in London where everything’s completely in the dark. This one I have not done either but I have possibly done something better… I’m going to a lovely restaurant in Paris on Thursday which comes with a fabulous recommendation from my manager. I still have the restaurant-in-the-dark place in the back of my mind though. So there you have it. Not progress as such. Not what you’d call ‘solid plans.’ It really just amounts to running for the bus and a planned drink with a friend from Namibia. But it is progress. Of a sort. So it’s my 200th post! Very exciting. I haven’t been swimming in a little while as I’ve had a cold so I’m going to try, from next week, to swim 200 lengths in honour of it. Not all at once. I’ll try a bit each day. I need to do 30 each day, right? Wish me luck! I’ve got lots of birthdays and excitement this week so am going to give it til Monday to start the challenge. Thanks for staying with me or joining me along the way. It has been lots and lots of fun. To celebrate this milestone and to embrace my recent trip to Italy and in honour of seeing a friend for the first time in ages, I prepared an Italian feast! I got a beautiful cookbook the other day. The most beautiful cookbook I’ve ever seen. It’s full of Venetian recipes and the antipasti section is amazing. In an effort to impress, I insisted on making one of everything! I finished work at 3pm and had timetabled in when to start everything so that I’d be ready by 7pm. I suddenly realised, at 3.35pm, that I didn’t have almonds for the cantuccini biscuits. I set my white wine and white wine vinegar and juniper berries to boil (for the pickled chicory) then I quickly grabbed my purse and ran down to the shop. I got the almonds and ran back to the house…. When I said ‘I quickly grabbed my purse’, that’s exactly what happened. I grabbed my purse AND NOTHING ELSE! I was locked out. There was no-one else with keys who would be back before 6pm. We had taken the spare key from the next door neighbour because it didn’t work anymore, it was always getting stuck. We kept meaning to get another cut, but didn’t. O no! The next door neighbour walked by and I explained my predicament. We went in her garden to see if I could climb over her fence into my garden and try and figure a way to get in. It’s not really a climb-over-able fence so I was stuck outside, pan boiling inside, on a tight schedule for preparing dinner, with no way into the house. We eventually got in but another neighbour played a very risky game of almost falling through a roof to do so and it all took about an hour. I was VERY behind schedule. When I was back in the kitchen, I pickled my chicory, made my duck stock, grilled my aubergines and dressed my rocket. I was back on track. As I was whizzing the almonds in my food processor for the cantuccini, it popped and stopped working! This was NOT on my schedule! It wouldn’t have been a very big deal had I not needed to whizz the duck breast fillets for my duck and porcini mushroom meatballs. My only option was my handheld whizzer thing. You know the type that you stick in a pot of soup to whizz all the lumps out? So there I was, with a handheld whizzer thing, trying to whizz duck breasts. I got it done in the end but it wasn’t easy and bits of mashed up raw duck kept flying about and sticking to my face and arms. I threw together an apparently Italian drink, minus the alcohol – elderflower cordial with mint, lemon and ice, then topped up with ginger beer. At this point, I noticed that the caster sugar was on the side, unopened and realised that in my panic over the food processor breaking while I was making cantuccini, I had forgotten to put the sugar in! What I had was a savory almond dough! I whipped the biscuits out of the oven and binned them then mixed some sugar into my remaining dough. It didn’t really mix in very well though. I just wrapped the dough in clingfilm, fridged it and hoped for the best. Next was the main course. We had a parmigiana, a roast tomato risotto, a duck and porcini meatball in a duck stock and tomato sauce, and scallops and pancetta on a bed of minty pea stuff. The parmigiana looks quite large and intimidating, I didn’t realise that when I cut it! After eating everything and having a bit of chitchat and sneaking another meatball or two, it was time to address the cantuccini disaster. I cut my dough into six pieces and put it in the oven. It did not go well. Because there wasn’t enough dry stuff in the mixture, it didn’t bake hard enough. It also wasn’t sweet enough. I made us espressos in a percolator, which were really strong, and we dipped our biscuits in. I felt a bit feeble, with my savory, slightly soft almond thingys. So I implemented a back up plan. There was ice cream in the freezer! Mascapone, cherry and pistachio. Score! The dinner was rescued and we tucked in. All in all, a success, I think. Happy 200th post to me! What a fabulous way to celebrate. Due another work emergency, I am writing in a rush again. So I thought I’d share something that’s been on my mind for a while. Since I finished my law degree actually. It’s stuff I’d like to do in the near future. I figure if I write it down, then I’ve said it out loud so there’s some obligation to at least try and do it. Ok, here goes…. So there it is. Realistically, 2 and 5 are the most achievable as they just require me making the effort to do it. Let’s see how the rest go. I’ve said them now. There’s no backing out….. I dare you to make your own and put it in the comments section. There’ll be no backing out then. Go on! Do it.